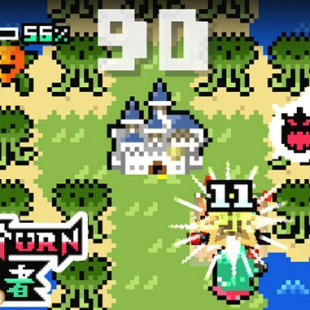 100 Turn Hero will release to iOS in Japan on January 17th, 2014. Originally released on the PSP back in 2009, Half-Minute Hero is the sort of game that pretty much sells itself on the quirk of its concept. While the game featured several game modes, the centerpiece of its experience, the "Hero 30" mode, challenged players to tackle a series of speed based stages that boiled classic RPG tropes down to their (often hilarious) essence and challenged to players to steamroll through them with a 30 second time limit counting down to the end of the world. It was, put shortly, a fast-paced and fun send-up to classic RPGs that was well-received and instantly memorable. That in mind, here's hoping that 100 Turn Hero, the latest game from Half-Minute Hero creator Kotaro Yoshida, will deliver a similarly fun take on the genre. While details on the new game are currently a tad sparse, if its title is any indicator players will only have 100 turns to conquer each of the game's stages. Considering how cleverly Half-Minute Hero executed its concept, we'll be eager to see what exactly 100 Turn Hero does with its mechanics. Sadly, even though 100 Turn Hero is set to release on iOS in Japan on January 17th, 2014, there's currently no mention of a wider release around the world. Considering the fact that Half-Minute Hero 2 never made it to North America, it might be fair to have concerns about whether or not we'll ever see the new game stateside. We'll keep our fingers crossed because we're really not content to watch this one from afar.